The General Services Administration (GSA), an independent agency of the United States government, was established in 1949 to help manage and support the basic functioning of federal agencies. GSA supplies products and communications for U.S. government offices, provides transportation and office space to federal employees, and develops government-wide cost-minimizing policies and other management tasks. GSA employs about 12,000 federal workers and has an annual operating budget of roughly $20.9 billion. GSA oversees $66 billion of procurement annually. It contributes to the management of about $500 billion in U.S. federal property, divided chiefly among 8,700 owned and leased buildings and a 215,000 vehicle motor pool. Among the real estate assets managed by GSA are the Ronald Reagan Building and International Trade Center in Washington, D.C. – the largest U.S. federal building after the Pentagon – and the Hart-Dole-Inouye Federal Center (which had previously been the Battle Creek Sanitarium run by John Harvey Kellogg). GSA's business lines include the Federal Acquisition Service (FAS) and the Public Buildings Service (PBS), as well as several Staff Offices including the Office of Government-wide Policy, the Office of Small Business Utilization, and the Office of Mission Assurance. As part of FAS, GSA's Technology Transformation Services (TTS) helps federal agencies improve delivery of information and services to the public. Key initiatives include FedRAMP, Cloud.gov, the USAGov platform (e.g., USA.gov, GobiernoUSA.gov, and Kids.gov), Data.gov, Performance.gov, and Challenge.gov. GSA is a member of the Procurement G6, an informal group leading the use of framework agreements and e-procurement instruments in public procurement. GSA became an independent agency on July 1, 1949, after the passage of the Federal Property and Administrative Services Act. General Jess Larson, Administrator of the War Assets Administration, was named GSA's first Administrator. The first job awaiting Administrator Larson and the newly formed GSA was a complete renovation of the White House. The structure had fallen into such a state of disrepair by 1949 that one inspector of the time said the historic structure was standing "purely from habit." Larson later explained the nature of the total renovation in depth by saying, "In order to make the White House structurally sound, it was necessary to completely dismantle, and I mean completely dismantle, everything from the White House except the four walls, which were constructed of stone. Everything, except the four walls without a roof, was finally stripped down, and that's where the work started." GSA worked closely with President Truman and First Lady Bess Truman to ensure that the new agency's first major project would be a success. 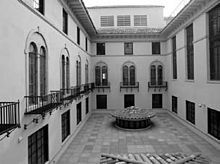 GSA completed the renovation in 1952. In 1986 GSA headquarters, U.S. General Services Administration Building, located at Eighteenth and F Streets, NW, was listed on the National Register of Historic Places, at the time serving as Interior Department offices. In 1960 GSA created the Federal Telecommunications System, a government-wide intercity telephone system. In 1962 the Ad Hoc Committee on Federal Office Space created a new building program to address obsolete office buildings in Washington, D.C., resulting in the construction of many of the offices that now line Independence Avenue. In 1970 the Nixon administration created the Consumer Product Information Coordinating Center, now part of USAGov. In 1974 the Federal Buildings Fund was initiated, allowing GSA to issue rent bills to federal agencies. In 1972 GSA established the Automated Data and Telecommunications Service, which later became the Office of Information Resources Management. In 1973 GSA created the Office of Federal Management Policy. GSA's Office of Acquisition Policy centralized procurement policy in 1978. GSA was initially responsible for emergency preparedness and stockpiling strategic materials to be used in wartime until these functions were transferred to the newly-created Federal Emergency Management Agency in 1979. In 1984 GSA introduced the federal government to the use of charge cards, known as the GMA SmartPay system. The National Archives and Records Administration was spun off into an independent agency in 1985. The same year, GSA began to provide governmentwide policy oversight and guidance for federal real property management as a result of an Executive Order signed by President Ronald Reagan. In 2003 the Federal Protective Service was moved to the Department of Homeland Security. In 2005 GSA reorganized to merge the Federal Supply Service (FSS) and Federal Technology Service (FTS) business lines into the Federal Acquisition Service (FAS). On April 3, 2009, President Barack Obama nominated Martha N. Johnson to serve as GSA Administrator. After a nine-month delay, the United States Senate confirmed her nomination on February 4, 2010. On April 2, 2012, Johnson resigned in the wake of a management-deficiency report that detailed improper payments for a 2010 "Western Regions" training conference put on by the Public Buildings Service in Las Vegas. In July 1991 GSA contractors began the excavation of what is now the Ted Weiss Federal Building in New York City. The planning for that building did not take into account the possibility of encountering the historic cemetery for colonial-era African New Yorkers located beneath the footprint of the $276-million-dollar office building. When initial excavation disturbed burials, destroying skeletons and artifacts, GSA sent archaeologists to excavate—but hid their findings from the public. Revelation of the discoveries led to 18 months of activism by African-descendant community members, public officials, academics, and concerned citizens. Ultimately, GSA made public amends by funding extensive scientific research under the auspices of Michael Blakey; creating a new subagency, the Office of Public Education and Interpretation; truncating the building plan; and funding public reports on the story of the African Burial Ground. The efforts led to the creation of a new unit of the National Park Service, The African Burial Ground National Monument, at the facility. GSA fully funded that portion of the National Park Service until 2010, when GSA's formal involvement with the African Burial Ground ceased. During President George W. Bush's Administration GSA Administrator, Lurita Doan, was forced to resign after GSA had awarded a sole source contract for $20,000 to her friend. Doan appeared to have violated the Hatch Act and was criticized for political activity while on the job. The investigating team recommended she be punished to the fullest extent, and she resigned soon after. In 2012 U.S. Representative John Mica, chairman of the House Transportation and Infrastructure Committee, called for a congressional investigation into the misuse of federal money by GSA. Lawmakers accused GSA of "lavish spending" following the 2010 Western Regions Training Conference at the M Resort in Las Vegas. GSA spent $823,000 in taxpayer money toward the October 2010 convention, including $100,405.37 spent on employee travel costs for a total of eight pre-planning meetings, scouting trips, and a "dry run." The report also found excessive spending for event planners, gifts for participants, and lavish meals. The conference had been the most recent in a series of similar lavish conferences organized by regions of GSA's Public Buildings Service. In May 2010 GSA treated 120 interns to a five-day conference at a Palm Springs, California, resort. An additional investigation led by Inspector General Brian D. Miller found 115 missing Apple iPods meant for an employee rewards program. GSA Administrator Martha N. Johnson resigned in the wake of the controversy. Before turning in her own resignation, Johnson fired two other GSA senior executives, Public Buildings Service head Robert Peck and senior advisor Stephen Leeds. Four PBS Regional Commissioners, who had been responsible for planning the conference, were placed on administrative leave. The Administrator is the chief executive of the General Services Administration. Emily W. Murphy was sworn in as Administrator on December 12, 2017 after being unanimously confirmed by the U.S. Senate on December 5, 2017. GSA consists of two major services: the Federal Acquisition Service (FAS), and the Public Buildings Service (PBS). In addition to these two major services, the agency also consists of twelve staff offices and two independent offices. GSA conducts its business activities through 11 offices (known as GSA Regions) throughout the United States. These regional offices are located in Atlanta, Boston, Chicago, Denver, Ft. Worth, Kansas City (Missouri), New York City, Philadelphia, San Francisco, Seattle (Auburn), and Washington, D.C. The Federal Acquisition Service (FAS) provides comprehensive solutions[clarification needed] for products and services across the government. GSA assists with procurement work for other government agencies. As part of this effort, it maintains the large GSA Schedules, which other agencies can use to buy goods and services. The GSA Schedule can be thought of as a collection of pre-negotiated contracts. Procurement managers from government agencies can view these agreements and make purchases from the GSA Schedule knowing that all legal obligations have been taken care of by GSA. The GSA Schedule is awarded as a prime contract entered into by the federal government and a vendor that has submitted an acceptable proposal. At the core of the GSA Schedule contract lie two key concepts: 1) Basis of Award customer or group of customers and 2) Price Reduction Clause. The two concepts are applied in concert to achieve the government's pricing objectives for the GSA Schedule program. Namely, the government wants to ensure that when the vendor experiences competitive pressures to reduce its pricing, then the government can benefit from these and be extended reduced pricing as well. The Basis of Award customer or group of customers represents the customer or group of customers whose sales are affected on the same terms and conditions as those with GSA, and whose pricing is used: 1) as the baseline during negotiations to establish discounts offered to GSA, and 2) as a price floor that, when breached, constitutes additional discounting that triggers the Price Reduction Clause. The Price Reduction Clause ensures that vendor discounting practices and GSA Schedule prices maintain a fixed relationship. The vendor specifies in its GSA proposal, and during negotiations of GSA Schedule contract prices, the discounts to be given to Basis of Award customer(s). If the vendor then provides a larger discount to a Basis of Award customer than what was agreed upon in the GSA Schedule contract (i.e., if the price floor is breached), then the vendor's GSA price will be reduced proportionately and retroactively. Effective Price Reduction Clause compliance procedures will protect vendors if their discounting practices are fully and accurately disclosed in their original proposals to GSA, and then are used as a basis for compliance over the term of the contract. Although not ideal, a compliance system implemented after a contract has been awarded can bring a contract into compliance, although sometimes at the expense of profits. If implementing a system in the middle of a contract period, inaccuracies that turn up should be corrected immediately, and the GSA contracting officer should be made aware of them. Price Reduction Clause compliance systems and procedures can range from simple to complex. A simple, manual system would be appropriate for a service contractor with standard labor rates that are not discounted. A complex system would be required for a reseller with thousands of products and discounting policies that differ among product groups. In response to increased mandates and standards required by the Federal Government of its agencies and in a push to plan for federal sustainability, GSA offers online tools to aid in the building and management of government offices that are subject to these requirements. GSA has delegated authority to the Department of Veterans Affairs (VA) to procure medical supplies under the VA Federal Supply Schedules Program. In 2018, GSA awarded federal government debt collection services to IC System. The Public Buildings Service (PBS) acquires and manages thousands of federal properties. In accordance with Title 40 of the United States Code, GSA is charged with promulgating regulations governing the acquisition, use, and disposal of real property (real estate and land) and personal property (essentially all other property). This activity is centered in GSA's Office of Governmentwide Policy. Policies promulgated by GSA are developed in collaboration with federal agencies, and are typically published for public comment in the Federal Register prior to publication as a Final Rule. The Public Buildings Service provides workplaces for federal customer agencies and United States courthouses at good economies to the American taxpayer. PBS is funded primarily through the Federal Buildings Fund, which is supported by rent from federal customer agencies. Disposal of surplus real property is managed by the Office of Property Disposal within the Public Buildings Service. The Office is responsible for property which includes land, office buildings, warehouses, former post offices, farms, family residences, commercial facilities, or airfields located in the United States, Puerto Rico, the U.S. Virgin Islands, or the U.S. Pacific Territories. Surplus property is made available to both government and private bidders and, in some cases, land sold for public purposes (such as parks or welfare) may be made available for a discount of up to 100% of the fair-market value. GSA has earned a LEED rating for 24 green buildings. Some of green offerings at new buildings includes green roofs (planted roofs that can substantially reduce rainwater run-off during storms and provide significant insulation for the buildings), underfloor air distribution (that delivers cooling and heating air at floor level instead of from the ceiling), purchasing and using renewable power from utility companies, and light shelves (located outside of the building that reduce the amount of heat radiating into the building from the sun while increasing the amount of natural light and high ceilings that help direct daylight deep into the work environment). The American Recovery and Reinvestment Act of 2009 made available not less than $4.5 billion for measures necessary to convert GSA facilities to High-Performance Green Buildings, as defined in the Energy Independence and Security Act of 2007 (Public Law 110-140). The Department of Energy's Federal Energy Management Program facilitates to GSA the implementation, through project transaction services, applied technology services and decision support services, to deploy renewable energy technologies and cultivate change to embrace energy efficiency. In 2004, GSA was presented with the Honor Award from the National Building Museum for "success in creating and maintaining innovative environments for the federal community as well as providing a positive federal presence for the public." GSA contributes to the management of U.S. Federal property, including a 215,000 vehicle motor pool. The American Recovery and Reinvestment Act of 2009 (stimulus bill) included $300 million to acquire energy-efficient motor vehicles for the federal fleet. President Barack Obama announced that GSA was to support the U.S. auto industry with orders for about 17,600 new fuel-efficient vehicles by June 1, 2009, on an accelerated schedule, with money from the American Recovery and Reinvestment Act. GSA was to pay $285 million to General Motors Corporation, Chrysler LLC, and Ford Motor Company. It was to include 2,500 hybrid sedans—the largest one–time purchase yet of hybrid vehicles for the federal government—and each new vehicle was claimed to yield at least a 10% fuel economy improvement over its predecessor. GSA was to spend $15 million more that year on a pilot fleet of advanced-technology vehicles, including all-electric vehicles and hybrid buses. Hybrids accounted for about 10 percent of the 145,473 vehicles the U.S. General Services Administration bought during the fiscal years 2009 and 2010, after making up less than 1 percent of government vehicle purchases in 2008. As for specific models, Obama took a buy-American stance. The U.S. government bought about two-thirds of the Chevrolet Malibu Hybrids sold during the past two years, and almost a third of the Ford Fusion Hybrids, but only 17 Toyota Prius hybrids and five Honda Civic Hybrids. Ground Force One, so designated when transporting the POTUS, is one of two armored buses procured in 2010 for the transportation of dignitaries under protection of the Secret Service, at a cost of $1.1 million each. The coaches were assembled in Tennessee on frames made in Canada. The Interagency Resources Management Conference (IRMCO) was a federal executive conference of the General Services Administration, hosting about 300 federal and industry leaders each year. The Interagency Resources Management Conference began in 1961 as the ADPCO conference. In 1979, the Department of Commerce, GSA and the Office of Management and Budget (OMB) jointly sponsored a conference for Senior Executive Service (SES) officials at Gettysburg, Pennsylvania. At the same time, the National Archives hosted a small records management conference for senior executives, also located in Gettysburg. These two conferences merged with ADPCO and became The Interagency Resources Management Conference. Over the years, the conference has evolved its focus from highly specialized to integrated. In 1996, when U.S. Congress mandated the role of Chief Information Officer (CIO), these new federal executives were invited to attend The Interagency Resources Management Conference. In 2008, Hosky was awarded a competitive contract to continue to manage and develop the forum. From 2008 to 2010, IRMCO drew attendees from about 65 federal agencies and diverse disciplines including information technology, human resources, acquisition, management and finance. Once travel restrictions and budget concerns surfaced in late 2010, IRMCO was moved to a local venue under the management services of A-S-K Associates, where primary attendance by industry was established as a means to inform commercial firms on GSA policies. IRMCO 2011 was held in Washington, D.C., at the Kellogg Conference Center and Hotel on the campus of Gallaudet University. Shortly after IRMCO 2011, GSA's Associate Administrator for Governmentwide Policy, Kathleen Turco, announced to media that she and other GSA officials felt that IRMCO had lost its spark and retired the event. Beginning with the Federal Citizen Information Center in 1970, GSA has had a long history of connecting the public to government information and services. In 2009, a new Office of Citizen Services and Innovative Technologies was created to expand the effort to serve the public through technology. GSA began managing the Presidential Innovation Fellows program the same year it launched 18F, a first of its kind startup within the agency, launched in 2014 with a team of 15 designers, engineers, and product specialists focused on improving the federal government’s digital services. Now all of those offices have joined forces under the Technology Transformation Services sub-unit of the Federal Acquisition Service. Its mission is to improve the public’s experience with the government by helping federal and state agencies build, buy, and share technology that allows them to better serve the public. Joanne Collins Smee is the director of the Technology Transformation Services and a deputy commissioner to Alan Thomas of the Federal Acquisition Service. The Centers of Excellence, introduced in October 2017, are working to accelerate the modernization of IT infrastructure and reduce legacy IT spending across government. In 2009, Section 1122 of the FY 1994 National Defense Authorization Act for Fiscal Year 2009 was added. This expanded the program from buying counter-drug materials and equipment at a discount to homeland security and emergency response operations. Besides GSA, the Department of Defense (DOD) and the Defense Logistics Agency (DLA) provide equipment, as in the 1033 program. ^ "GSA site, scroll down to Agency Data section". GSA. Retrieved 2016-03-21. ^ a b "GSA Organization". U.S. General Services Administration. 2017-01-24. ^ "Mission and Priorities". U.S. General Services Administration. 2013-01-15. Retrieved 2013-02-08. ^ "Office of Products and Programs". U.S. General Services Administration. 2017-03-16. ^ "GSA Assists in Coordinated Effort To Transform White House Press Briefing Room". U.S. General Services Administration. Archived from the original on 2008-09-20. Retrieved 2012-07-08. ^ a b c "A Brief History of GSA". GSA.gov. Retrieved March 18, 2017. ^ "GSA Releases Draft FTS/FSS Reorganization Plan (GSA News Release #10161)" (Press release). U.S. General Services Administration. June 2, 2005. Archived from the original on May 28, 2014. ^ a b Brockell, Gillian (2012-04-04). "Former GSA head faults regional commissioners in spending scandal". FederalNewsRadio.com. Retrieved 2012-06-12. ^ "The African Burial Ground". U.S. General Services Administration. Retrieved 2013-02-08. ^ "African Burial Ground National Monument New York". National Park Service. Retrieved 2012-06-12. ^ O'Harrow Jr., Robert; Scott Higham (May 1, 2008). "Doan Ends Her Stormy Tenure as GSA Chief". Washington Post. Retrieved 2013-10-04. ^ Elliott, Philip. "GSA head resigns amid reports of lavish spending". MSNBC. Washington DC. Associated Press. Archived from the original on 12 April 2012. ^ Berger, Judson (April 7, 2010). "Agency under fire for Vegas conference had ballooning budgets in recent years". Fox News. Retrieved 2012-06-12. ^ Rein, Lisa; Smith, Timothy R. (2011-06-28). "GSA conference went 'over the top'". The Washington Post. Retrieved 2012-06-12. ^ Elliott, Phillip (April 2, 2012). "GSA head resigns amid reports of lavish spending at Las Vegas conference". Las Vegas Review-Journal. Retrieved March 18, 2017. ^ Subramanian, Courtney (April 18, 2012). "GSA Scandal" So What Does $823,000 Buy You in Las Vegas?". Time Magazine. Retrieved March 18, 2017. ^ "GSA Office of Inspector General". ^ "U.S. Civilian Board of Contract Appeals". ^ "FAS Initiatives". U.S. General Services Administration. 2012-12-17. Retrieved 2013-02-08. ^ "GSA Schedules". U.S. General Services Administration. 29 January 2013. Retrieved 8 February 2013. ^ "GSA Schedule Price Reduction Clause (PRC) Compliance". Fedmarket. ^ "SFTool - Sustainable Facilities Tool - GSA Sustainable Facilities Tool". ^ "38.000 Scope of part". Acquisition.gov. Retrieved 2016-03-25. ^ "IC System Receives GSA Certification". ^ "Authorized Federal Supply Schedule Price List" (PDF). ^ a b "Public Buildings Service". U.S. General Services Administration. Archived from the original on 2010-07-14. Retrieved 2012-06-12. ^ a b "CRS Report: RS20630 - Surplus Federal Property - NLE". Congressional Research Service (CRS), part of the U.S. Library of Congress. Archived from the original on July 26, 2011. ^ "LEED Certified Projects". U.S. General Services Administration. 2013-01-25. Retrieved 2013-02-08. ^ "Green Roof Building Information". U.S. General Services Administration. 2012-05-18. Archived from the original on 2013-03-12. Retrieved 2013-02-08. ^ "Wayne L. Morse Courthouse (Eugene, OR)". U.S. General Services Administration. 2012-02-13. Retrieved 2013-02-08. ^ "(Unknown title: dead link)". U.S. General Services Administration. Archived from the original on 2012-01-11. ^ "Federal Energy Management Program". U.S. Department of Energy. 2013-01-14. Retrieved 2013-02-08. ^ "A Salute to the U.S. General Services Administration". National Building Museum. June 3, 2004. Retrieved 2012-06-12. ^ The White House Office of the Press Secretary (April 9, 2009). "President Obama Announces Accelerated Purchase of 17,600 New American Vehicles for Government Fleet |" (Press release). The White House (www.Whitehouse.gov). Retrieved 2012-06-12. ^ Scott Doggett (November 11, 2010). "Obama Administration Buys Nearly 1 in 4 Hybrids as Consumer Market Slumps - AutoObserver". Blogs.edmunds.com. Archived from the original on 2010-11-28. Retrieved 2012-06-12. ^ Robert Farley (25 August 2011). "Obama's Canadian-American Bus". FactCheck. Retrieved 2011-10-17. ^ "CIO Council - Cohen Part II". Chief Information Officers Council (Cio.gov). 1998-01-01. Archived from the original on 2012-06-10. Retrieved 2012-06-12. ^ "Washington DC Conference Center and Hotel, Plan Business Meetings and Events". Kellogg Conference Center. Retrieved 2012-06-12. ^ Weigelt, Matthew. (2012-03-15) IRMCO is done, Acquisition Excellence takes its place. FCW. Retrieved on 2013-07-19. ^ GSA. "1122 Program". GSA. Retrieved 28 November 2014. This article incorporates public domain material from websites or documents of the General Services Administration.